Even without flash atomization, gasdynamics will break up the pressure-driven, high-velocity HF stream into small droplets, and much of the droplets will evaporate into a toxic vapor before they hit the ground. To experimentally evaluate this process, in 1993 Quest Consultants were contracted by Mobil to perform a large-scale experimental evaluation in Quest’s Oklahoma facility. We learned from Quest’s Principal Investigator, John Cornwell, in his excellent presentation at the September 22, 2018 AQMD Refinery Committee Meeting (Watch: https://youtu.be/qwo08BtEQuM?t=7618) that these were the only large-scale tests conducted with MHF, and Mobil engineers selected all the test conditions. 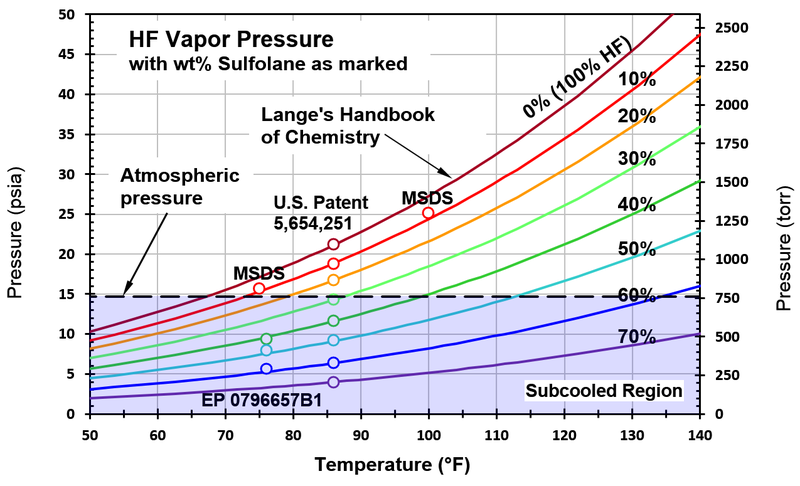 In their 1993 paper “Large-Scale Release Testing of a Modified HF Alkylation Catalyst,” Mobil engineers redacted the Sulfolane concentration levels, but they are easy to figure out by comparing the test summary to U.S. Patent 528,456. The test conditions are shown by black dots in the graph below. As could be anticipated, none of the tests were with superheated MHF. 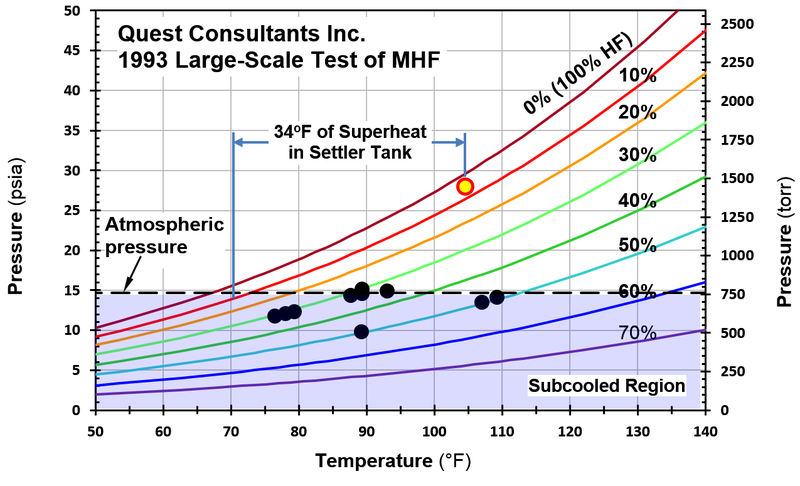 Today’s 6 wt% MHF is shown on the graph with 34oF of superheat — far more than the minimum for flash atomization. Bottom line: There are no large-scale tests with the low-Sulfolane-level, superheated MHF used in today’s refineries to support the refineries’ false claim that MHF will not flash atomize. In fact, today’s low-Sulfolane-level MHF behaves just like HF. Previous Previous post: “Flash Atomization of HF and MHF” by George Harpole, Ph.D.
Next Next post: “HF Boil-Off from an MHF Spill on Hot Highway Pavement” by Jim Eninger, Ph.D.